On June 28, 1997, we re-opened the dig on the Bird Family Tylosaur with the generous help of volunteers from around the country (and around the world!). Dr. Glenn Storrs had arrived on the 27th with a field crew from the Cincinnati Museum of Natural History and Science. They had already spent two weeks in Kansas, camping out and looking at Cretaceous marine fossils and fossil localities. His three graduate students included a young lady from Japan, Tamaki Sato. She is a graduate student at the University of Cincinnati and is studying short necked plesiosaurs (pliosaurs). Derek Parker, also from the University of Cincinnati, and James Damico from the Cincinnati Museum completed the Field Crew. Also arriving early from out-of-state (Illinois) was Richard Swigart who had volunteered to work on the dig, sight unseen. On the 28th, we added a group of 4-Hers from the Salina area, a local high school student (Dusty Werth), Angie and Mark from the Wichita area with lots of digging experience, and a group from a Wichita computer graphics company that was taking pictures for a paleontology project that they are working on. During the day, we also had numerous local people (the native prairie above the dig site looked like a parking lot at one point), including the Bird family (the property owners and lots of their grandchildren!) and various neighbors. Saturday was cloudless, with temperatures reaching the mid-90s. As usual in Kansas, there was a nice breeze from the south, but unfortunately, the location of the site, deep in a gully, kept the wind away from the people who would have enjoyed it the most (those doing the digging!). It bright and hot and a great day to dig. As volunteers began arriving in the morning, we removed the tarp that had covered the remains for the last two months. Everything was just as we had left it. Our plan was to continue clearing the overburden off of the fossil bearing layer in hopes of finding additional remains. Unfortunately, we would not be able to add much to what had already been found. Some of the bones that were found in various places near the skull of the tylosaur, including the right post-orbital frontal (a bone from over and behind the right eye), one of the pterygoids from the roof of the mouth,, several vertebrae from various places in the vertebral column, a femur and a few paddle bones. When this mosasaur had died 85 million years ago, the body had come to rest on the sea floor with the head and neck in a more or less north-south alignment. A narrow gully eventually exposed the remains by cutting across just behind the last cervical vertebra. When we removed in the skull and cervicals in 1996, we could see another vertebra exposed on the north side of the gully, about three feet away. Measurements indicated that seven or eight thoracic vertebrae may have been eroded away and lost prior to discovery, but we were hopeful of finding the rest of the animal laid out along a north-south line, safe and secure under four feet of hard chalk. Those hopes were dashed in May of 1997, when we used a backhoe to remove most of the overburden and a group of volunteers from the New Jersey Paleontological Society to re-open the site. Almost immediately, we discovered that the general direction of the remains had changed and was now turned to the west-northwest. It was apparent that much more (front paddles, all but one of the thoracic vertebrae and most of the ribs) had been lost down the gully. The abdominal vertebrae were still articulated and at least part of the pelvis was still in place, but the vertebrae comprising tail of the animal were scattered everywhere. It appeared that something (probably sharks) had scavenged the remains after it reached the sea bottom and carried off some of the limb material. 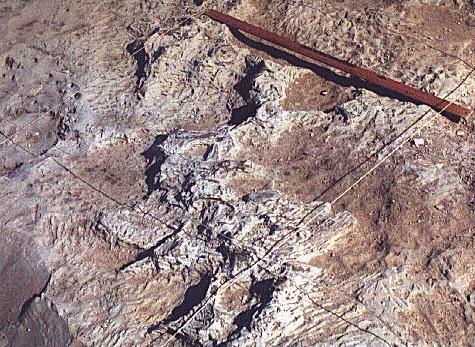 In addition, the remains ended a few feet from the pelvis at edge of the larger gully to the west. Some of the remains had probably weathered out many years ago. In June, there was still a large expanse of chalk to the north of the remains and we were hopeful that some of the missing parts would be found in that area. The crew worked side by side for most of the day, clearing away the remaining 4-6 inches of chalk to get to the level where any bones could be expected to be found. Aside from a few more caudal vertebrae and small paddle bones, nothing else was discovered. We did locate a small number of Squalicorax teeth but not enough to indicate that this shark had been responsible for the scattering of the mosasaur bones. By late afternoon on Saturday, we had decided to close the dig, document what we had found and remove the bones the next day. We were hot and tired, and decided that pictures would wait until the next day. Everyone headed out, looking forward to getting cleaned up and getting lots of cold liquids to drink. Many of the crew were staying in tents, including two volunteers from Wichita who decided to camp out at the site so they could get pictures of the sunrise. After supper, just before sundown, we noticed a cloud bank coming up in the sky to the northwest. Since the weather in Kansas is always changing, we looked at the forecast and saw that the storm system was supposed to move to the north east and away from us. However, as might be expected, the weather fooled the forecasters again, and about four A.M., wind, lightning and rain hit as a large thunderstorm passed through the area. Then it rained hard for an hour or so. We got up early and checked on the people who had camped out. They had had an interesting night, with lightning striking often and fairly close at times. However, they stayed dry and were none the worse for wear. Our concerns then turned to getting into the dig site and to the couple who had spent the night there. We drove out of town and quickly found that the dirt roads were muddy and slippery. These are the same county roads that many of the locals drive normally at speeds over 60 mph in dry weather and that pack so well that they are actually smoother than the Interstate in some areas. Unfortunately, when they get wet, they can become impassable in a hurry. The last mile into the site did not even qualify as a dirt road and was even in worse condition than the regular roads. It was time for a tough decision. In spite of the fact we had so many willing volunteers available to us and needed only a few more hours work to complete the dig, we decided that it was not worth fighting the mud and getting people stuck. We told everyone that the dig was off for the day, thanked them for their help and tried to get in touch with the landowner so that the couple still at the site could be assisted as they tried to get out. Later, we found that it took them four hours just to reach the main dirt road! Late in the afternoon of Friday, August 7, Pam and I returned to the site for what we hoped would be the completion of the dig. Storms and rainy weather had already plagued several of our outings during 1997, and we were somewhat nervous about a storm front that was then moving across the Rockies. We had another crew of volunteers scheduled to work with us on Saturday, (and Sunday, if needed) but we were fairly certain that we could wrap things up in less than a day. The site had been tarped down since just before our last rain-out in June. As we walked down the hill, we were somewhat surprised to see that the bright blue tarp had been blown off the exposed bones! A storm earlier in the week had lifted the tarp, along with the heavy rocks that were weighting it down and moved everything off into a nearby gully. Even worse, a herd of cattle had left their muddy hoof prints across the exposure! There was a sudden feeling of dread as I scanned the mosasaur remains for any sign of damage to the bones. I was amazed and relieved to find that there was none! Since we already had most of the bones exposed, I began work on gridding off the site in one-meter squares so that I could accurately locate each of the elements of the skeleton before we removed them. I laid out a 3 by 4 meter grid along a north-south axis and then drove nails into the chalk at the meter marks around the parameter. Then I used string to connect the nails into squares that were one meter on each side. This gave me the reference points that I needed to place the location of the bones on a drawing. The ugly results of a lot of work. The looking to the northwest along the abdominal vertebrae, pelvis (near center of picture) and scattered caudal vertebrae. By the time I was finished, the sun was beginning to go down. We picked up our gear and headed back to our motel, hoping that the weather would give us enough time to get the material out of the ground. On Saturday, the sky was cloudless.........sort of too much of a good thing for Kansas in August. We went out to the site early in the morning and I began photographing the bones while they were still in the ground, using the grid lines for reference. About that time, the first of our volunteers, Steve Johnson, drove up to the site. Then, as we were giving him a quick tour, two other volunteers, Angie and Mark showed up. We were going to try and finish things up with just the four of us working on the exposure. Although we had had as many as a dozen people working the site at one time in June, we were down to the point where more than four would just get in each others way. LEFT: The crew for the final dig.......Angie, Pam, Steve and Mark. We began by removing the smaller pieces of the skeleton first.....the paddle bones and isolated vertebrae. Steve started to clear away chalk from around the abdominal vertebrae which were still articulated, and found fish bones and scales. We looked closer and discovered that he may have found the remains of stomach contents from the mosasaurs last meal. 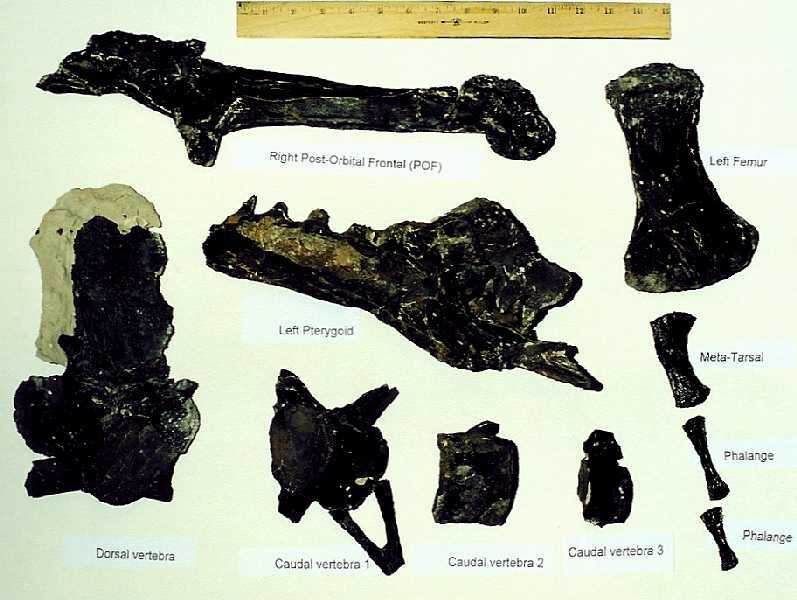 The pieces were tiny and scattered, compared to the much larger mosasaur bones, but they were certainly important to the study of this specimen. 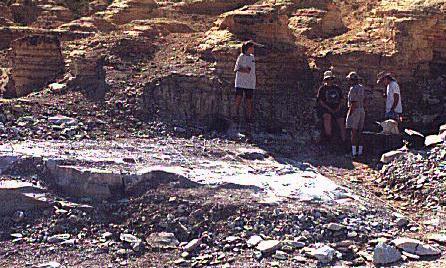 We removed the material in large chunks so that we could study it later during the final preparation of the mosasaur. While Angie and Mark were taking some of the isolated elements of mosasaur bone out of the chalk and handing them to me for bagging and marking, they started running into new material. It was becoming increasingly apparent that something had scavenged the mosasaurs carcass as it rested on the sea bottom. We had a complete skull and all of the neck vertebrae, but from the neck down, things just seemed to fall apart. There were seven or eight vertebrae in the lower back that were still articulated, and half of the pelvis, but everything else was randomly scattered. Of the seventy or so vertebrae that should have been in the tail alone, we could only find about 15. Of the major limb bones (two each: humerus, radius and ulna; femur, tibia and fibula), we could only find one. Once we had uncovered everything, it appeared that we only had 30-40% of the skeletal elements from below the neck. LEFT: A view looking down on the gridded dig site. Most of the remains are to the left of the meter stick. 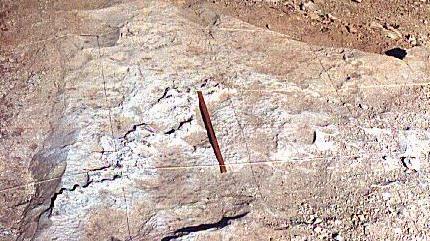 It is possible that some elements were still buried in the chalk to the north of the exposed remains. 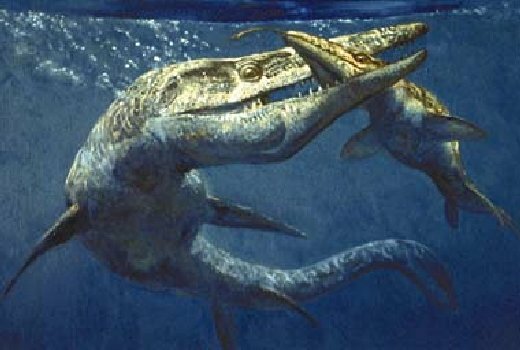 It is more likely that many of the mosasaurs bones, especially the limbs, had been carried off by scavengers before burial. We were fairly certain that the ribs, most of the thoracic vertebrae and possibly the front limbs had eroded out in the channel that had exposed the skull to begin with. I would like to take this opportunity to thank all of the people who volunteered their time to help on the site. We would not have gotten this far without you! We will make sure that everyone gets credit in the official records kept with the fossil at the Fick Fossil and History Museum.